NEW IBM 24P3766 146GB 10K Hot-Swap SCSI Drive w/Tray Caddy. 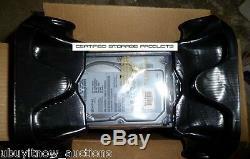 IBM Option P/N: 32P0750 146Gb SCSI Drive 80-Pin FRU: 32P0760. Its New in the MFG Box and is ready to go to work, RARE FIND!! IF YOUR LOOKING FOR A GOOD DEAL.. DETAILS: IBM 146GB SCSI Hot Swap Hard Drive. Includes IBM Tray Option P/N: 32P0750. IBM FRU Part Number: 32P0760. REGARDING SCSI DRIVE PRODUCTS: If you Need MORE TAPES, If you Need a New or Tested SCSI Data Tape Drive, Tape Media, Cleaning Tape Cartridges. SCSI Cables, Terminator or a QIC SLR tape, DC300A, DC600A, DC615A, DC6150, DC6250. DC6525, DC9120, DC9200, DC9250, Magnus 2.0. 2.5, SLR1, SLR2, SLR3, SLR4, SLR5, SLR6, SLR7, SLR24, 13/26GB, SLR32, SLR40. SLR50, SLR60, SLR75, SLR100, SLR140, SLR200, MLR. 35L0844, 5678-2, VXA, VXA-1, VXA-2, VXA-3, V6, X6. V10, X10, X23, VXA-172, VXA-320, QIC, Travan, DLT, DLT1. VS1, VS160, VS80, DLT-V4, DLT-S4, DDS. DAT, SLR7, DDS-2, DAT8, D. DS-3, DAT24, DDS-4, DAT40, DAT320, DAT160, DAT72, DDS-5, LTO. SDLT, Ultrium, LTO-1, LOT-2, LTO-3, LTO-4, LTO-5, LTO-6. SAIT, AIT-2, AIT-3, AIT-4, AIT-5, SDX1-25C, SDX1-35C, Mammoth, M-2. M2, 9.1GB Optical, Magneto Optical, UDO, Differential Drive. Ultra160, Ultra 160, USB, 32-pin, 40-pin, 50-pin, Hot. Swap, SAS, Solid State, ADIC, APPLE, ArcServe, Avaya. At&t, Adaptec, ATTO, Archive, ATL, AS/400, AES. Colorado, Certance, Compaq, Canon, CISCO. DELL Dysan, Ecrix, Exabyte, EZQuest, Emulex, Emtec, Emerald. Cartridge, HP, Georgens, Graham, Hewlett Packard, IBM, Imation, I. Omega, Irwin, Kodak, Lacie, LMSI, M4 Data, Maxtor. PowerVault, Quantum, Ricoh, Rimage, Sony, Syquest, SUN, Sysgen, Sankyo, SureStore. Storageworks, Seagate, Spectralogic, StorageTek, Siemens. Straightline Harrier, Mass Storage, Storage Racks, Server, Teac, Tecmar, Toshiba. Tri-optic barcode labels, TDK, Verbatim, duplicators. Loaders, HBA's, JBOD, Raid, SAN, NAS, software. Smart and Friendly, WangDat, WYSE, WICAT, Wangtek, Western Digital. Xcerta, Yamaha, peripherals, host adapters, controllers, bridges, routers. Case, enclosure, CI DESIGN, GadZoox, Initio, JMR, JNI, Slim. Lucent, Digital, Server, MAC, PC, OS, Hornet, Wang, Tandy. Turbo AIT, drives compatible to RS/6000, 7205, Scaler, USB. Firewire, UNIX, Linux, SCO, FreeBSD, Solaris, AIX, HP-UX. 2000, 2003, 2007, Cloud, Backup, Workstation System. PX-Series or a Tape Autoloader Library Data Storage Drives. 3480, 3490, 3570, 3590, 9840, 9940. JAZ, ZIP, CDR-RW, DVD-R/RAM, Plasmon P5200W, HP 88146J, P5200, 59H4789. C7983A, P9100W, 9.1 GB, CWO-9100C, 9.1GB. 4TB, 5TB drives, please don't hesitate to contact me. I have thousands of media. Tapes and scsi drives available. I can list what you need. Please contact me if there is a problem before you consider leaving feedback, I work very hard and I take pride in my work, I do aim to please! If you have any questions please contact me. Looking for some other good products! Check out my other STORE items!!!! The item "NEW IBM 24P3766 146GB 10k U160 80-PIN SCSI Hard Drive wTray 32P0750 FRU 32P0760" is in sale since Friday, April 28, 2017. This item is in the category "Computers/Tablets & Networking\Drives, Storage & Blank Media\Hard Drives (HDD, SSD & NAS)\Internal Hard Disk Drives". The seller is "ubuyitnow_auctions" and is located in Commerce, Texas. This item can be shipped worldwide.